Windows 8 tablets come in two basic models: Windows RT tablets, and Windows 8 tablets. 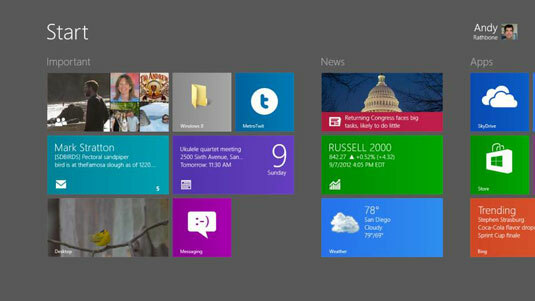 Both run Microsoft’s new Windows 8 operating system, but with slight differences. They’re each designed to serve slightly different needs. The designers of Windows RT assume you’ll spend most of your time on Windows 8’s new Start screen. Windows 8’s Start screen contains small programs known as apps. Just like the apps on a smartphone or an iPad, they let you browse the web, check e-mail, play movies and music, and keep in touch with friends on Facebook. Windows RT is aimed at people who prefer a long battery life rather than speed and power. To preserve battery life, Windows RT differs from Windows 8 tablets in one key way: It won’t let you install programs on the Windows desktop. The desktop hasn’t disappeared, however. When you open Windows RT’s Desktop app, the same ol’ Windows desktop appears. You can still manage files with File Explorer, call up the desktop’s Control Panel, open windows, and perform the usual desktop mechanics. But you’re stuck with what comes built in to Windows RT’s desktop. To make the anemic desktop more attractive, Microsoft tosses in free desktop versions of Microsoft Word, Excel, PowerPoint, and OneNote. Windows RT comes pre-installed on tablets or laptops. You can’t buy the operating system separately, nor can you install it onto a different computer yourself. The Windows 8 Start screen works best with touchscreens, so you’ll find it mostly on touchscreen tablets and touchscreen laptops. You won’t find Windows RT sold on desktop PCs. Windows 8 tablets come in two types: Windows 8 tablets, which are aimed at consumers, and Windows 8 Pro tablets, which are aimed at businesses. Windows 8 tablets include the Start screen and its apps, just like Windows RT. However, these powerful tablets also include a fully-functional Windows desktop. Microsoft refers to the Windows 8 tablet as “no compromises.” It lets you run the finger-friendly Start screen apps while traveling. Then, when it’s time to work, you can load the Windows desktop and fire up your favorite Windows programs. Perhaps most important, Windows 8 tablets lack the battery life to run all day. If you plan on using your tablet mainly between power outlets, however, you’ll do fine. Windows 8 Pro includes support for Windows Server domains, encryption, virtual hard drives, BitLocker, and other technical programs required in some businesses. Think of Windows 8 tablets as “real” computers that happen to be tablets, as well. If you’re looking mainly to consume content — watch movies, listen to music, read e-mail, or catch up with friends — a simple tablet works fine, and the Start screen apps easily handle all of those tasks. But if you need to create content — write reports, crunch numbers in a spreadsheet, or whip up a PowerPoint presentation — you’ll need the desktop. And although you can use your fingers on a tablet’s touchscreen desktop, you’ll work more quickly after attaching a mouse and keyboard. To handle the need for an occasional mouse and keyboard, many tablets today come in the form of hybrids — a fancy term simply meaning they include keyboards and mice/trackpads that detach or fold back when not in use. Hybrid tablets give you the versatility of a tablet, but let you turn them back into a laptop for desktop work. Windows 8 has stirred a flurry of excitement among computer manufacturers, and you find a wide variety of hybrid Windows 8 tablets. Some include detachable trackpads and keyboards, held in place by hinges, hoops, or magnets. Are they easy to remove, yet still easy to carry around? Are they sturdy enough to stand up to road wear? Do the detachable parts serve another purpose when detached? Or are they deadweight you’ll still have to carry around when not in use? How much do they add to the price? Are they a better solution than simply carrying around a small mouse and keyboard in your gadget bag? Price: The bottom line comes down to price, and that’s a decision only you can make. As of this writing, Windows RT tablets cost between $500 and $800, and Windows 8 tablets will set you back between $600 and $1,200.